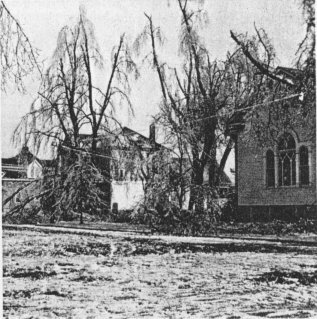 A memorable event of December 1924 was the spectacular sleet storm. It began with a freezing rain, which continued until trees, shrubbery, and wires were heavily coated with ice and a strong wind followed. All through the night the town was kept awake by a realistic imita­tion of cannon bombardment as limbs broke with ex­plosive sounds. Wires were pulled down leaving the town without electricity. Then was history turned back­ward; homes were lighted with candles or kerosene lamps and water was carried in from outside wells. With fallen trees and tangled wires making it unsafe to venture forth on the dark streets, families spent their evenings at home. Other early scenes were reenacted as with saws and axes modern living was gradually restored.